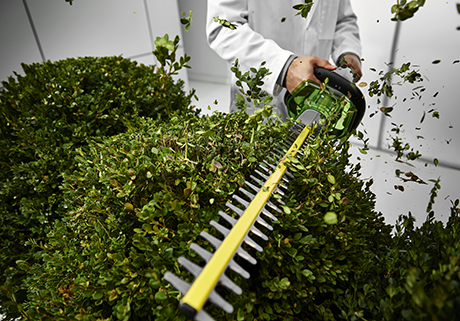 The EGO POWER+ Hedge Trimmer is the most powerful rechargeable hedge trimmer on the market and the first to perform better than many premium petrol-powered models. 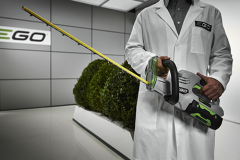 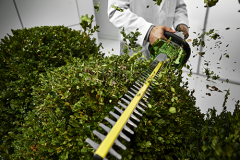 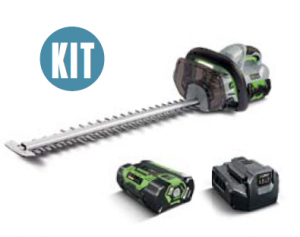 The features of the EGO POWER+ Hedge Trimmer include: Weather resistant construction (ipx4), 24” dual-action, hardened steel blades for precise cuts that promote new growth; 3,000 Strokes Per Minute (SPM) for clean, fast cuts; and a large cutting capacity that allows the trimmer to cut branches up to ¾” thick. 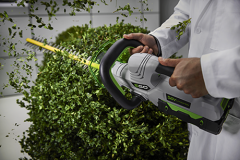 It runs on the industry’s most powerful battery: the first-ever 56-volt Lithium-Ion battery with 40% more power than the leading 40-volt battery. The EGO POWER+ Hedge Trimmer delivers the performance of petrol without the noise, fuss, and fumes.